Ein el Helwe camp - As Washington and London were affirming the past few days their intentions to continue to arm “moderate rebel factions” in Syria, Tel Aviv just announced it would like to be helpful by joining with “moderate Arab nations” to battle their mutual Muslim enemies. Basically “Israel wants to do what Shite Iran has started doing” he continued, which according to the New York Times is flying surveillance drones over Iraq and sending military equipment to help Baghdad fight the Sunni insurgents. Except Israel wants to arm the Sunni tribes in league with the West and the Gulf monarchies and not arm the Shia. Israeli officials and AIPAC are arguing to Washington that Israeli interests were converging with moderate Arab nations and “both sides should be dealing with the threat of Iran, world jihad and al-Qaida, as well as the spill-over of conflicts in Syria and in Iraq to neighboring countries.” The Israeli embassy issued a statement, “Today, (6/26/14) there is a basis for the creation of a new diplomatic-political structure in the Middle East.” Yet another ‘New Middle East’, one wonders? This week, (6/22/14) on NBC’s Meet the Press, Israel’s Prime Minister Netanyahu restated the half-century old Zionist project and continuing to permanently divide and control the Middle East. On the subject of the Islamic State of Iraq and Syria (DAASH) Netanyahu expressed the intention of his regime to continue to promote internal strife in Israel’s neighboring states. “We must weaken both [Sunni and Shia Muslims],” Netanyahu said, restating his governments preferred policy to have Muslims continue fighting among themselves. “When your enemies are fighting each other, don’t strengthen either one of them, weaken both,” he told the American public. While it would not be the first time the Zionist regime has worked with preferred members of the Arab League to advance its own interests, another strong incentive to ratchet up its “split the Arabs” policy is the popular spill-over political effects of the advancements of DAASH in Iraq and Syria. Briefly stated, Lebanon is awash with rumors about a “Sunni uprising” to regain what is viewed by some in Lebanon and the region as seeking justice for their substantial political and economic loses since the 2003 Bush-Blair invasion of Iraq. If the Gulf Kingdoms and the West agree to share information and leverage with respect to Iraq and Syria with Netanyahu & Co., it will be with the knowledge that Israel has another motive in wanting to join the coalescing forces against ISIS (DAASH). Presumably it is also is what its Lebanon based agents are surely reporting from the Palestinian camps. Briefly put Palestinian camps generally, and using Ein el Helwe, in Saida, Lebanon as an example, are beginning to experience what Nahr el Bared camp near Tripoli, Lebanon did in 2007. At Nahr al Bared, over a period of more than six months began to notice the arrival of ‘strangers.’ Some camp residents asked “Who are those guys”? At first the new arrivals appeared to be rather self-effacing, very polite, and seemingly deeply religious. They tended to keep to themselves and soon their families arrived. More than one Sheik in Nahr al Bared assured the camp residents that the strangers were “good Muslims” and some were even teaching lessons from the Koran at the Mosque. Fast forward, and as one of the Nahr el Bared camp leader explained in great detail to this observer at the time, soon residents soon began to notice changes in what were in fact affiliates or members of a new group calling itself “Fatah el Islam (FEI).” For example, the Islamists began to accost women on the street demanding that they wear a full length Hijabs and to stop smoking and more generally change their ways to be “better Muslims”. Today, FEI is relatively strong and growing, but secretively in Ein el Helwe. But they are not alone. New arrivals, plus young, unemployed, discouraged and increasingly disenchanted and angry youth are reportedly secretly holding meetings with DAASH, Al Nusra and other recruiters and they are promised immediate material benefits and soon to be granted the full right to work plus a deepening Resistance to the occupation of their country, Palestine. There are takers naturally, but numbers so far are difficult to learn. Militias are growing in the camps but it’s difficult to calculate just how fast because camp residents know of many outside intelligence agents living among them, ranging from Lebanese Internal Security to Zionist agents and many others, so keeping their work secret is most essential. According to analysts in Lebanon, and a recent report in Now Lebanon, the small cells based in rural northern Lebanon, the eastern Bekaa, and the Palestinian camps, where law enforcement remains very difficult are expanding due to the ISIS’ surge in Iraq and its apparent success in securing popular support from Sunni tribes and former Baathist groups. Fears continue to spread that the Sunni-Shiite sectarian struggle will explode in Lebanon as well. But the threat does not come only from outside Lebanon’s borders, according to a security source in Ain al-Helweh Palestinian refugee camp. The source reported that he has been receiving information recently about Jihadist factions mobilizing in several areas of Lebanon, including Palestinian refugee camps with both DAASH (ISIS) and al Nusra Front setting up training camps. According to one source, Jihadists reportedly are not only mobilizing inside the Palestinian camps: it is happening across Lebanon, especially after the Qalamoun second battle. Fanatic Muslims and takfiris are spreading very fast. “What is happening in Iraq and Qalamoun shows that the situation will soon be very dangerous in the region, including Lebanon. It will all become a jihad battlefield,” the source said. Two active and knowledgeable Palestinians from Ein el Helwe camp explained to this observer this week as they introduced me to the leader of Fatah el Islam, “Of course all the camps are affected just like everyone else around here by what has been happening in Iraq and Syria. Palestinians always want to avoid local fights but we always seem to be pulled in. Look what happened in the Lebanese civil war. Our leadership tried everything it could do stay out of the sectarian fight but we were pulled in and paid a huge price. Both the Zionist poll and the informal one done in Palestinian camps in Lebanon find board support for popular resistance against the Zionist occupation seen as having a positive impact by most respondents in Gaza, the West Bank and Lebanon. These activities include stepped up demonstrations, building more support for the BDS campaign, strikes, marches, and mass refusals to cooperate, though various acts of Resistance to confront the Zionist occupiers. Increased Resistance is seen as having a positive impact by most respondents in both territories: 62% in the West Bank, 73% in Gaza and close to 90% in Ein el Helwe. Meanwhile, a twitter account with 21,000 followers, one of many, and this one dubbed the “League of Supporters”, called this week for DAASH sympathizers to post messages warning America not to carry out airstrikes against DAASH. Rather they urged their supporters to prepare to follow them and to confront the Zionists across Palestine. In summation, the Zionist regime is very aware that the camps are likely to explode for a number of reasons not least of which the lack of civil rights including Palestinians is being banned from most jobs and the rising anger in and among the camps. It is also the case that the Zionists realize that the future looks bleak for its continuing occupation of Palestine internationally and helping stamp our extremist Jihadists, even by working with Arab regimes, and to weaken Iran in the process, it what it must do. “Look back over the past, with its changing empires that rose and fell, and you can foresee the future, too” (Marcus Aurelius). “The barbarians are at the gates,” says the headline of an article about the Iraq crisis by Patrick Cockburn, the veteran Middle East correspondent for the UK Independent. A fierce critic of the U.S.-British war on Iraq, Cockburn is now urging the U.S. and Iran to collaborate in stopping the forces of ISIS (the Islamic State of Iraq and Syria) that are sweeping through Iraq, a country that Cockburn loves more than the despotic politicians who have run it now or then. Separating truth from propaganda has never been more difficult - Iranian poster commemorating shooting down of Iranian airliner by USS Vincennes July 3, 1988, killing all 290 people aboard. The difference is that ISIS now seizes and holds territory, operating like an army, not just killing civilians to spread fear. ISIS is said to be a spinoff of al-Qaeda but we don’t know how or if al-Qaeda still exists. Even as ISIS portrays itself more as a corporation than a gang of brigands, all we see or hear about in the U.S. media are bloody killings and beheadings as if savagery is uniquely to be found in the Islamic world. Never mind the reporting of the McClatchy newspapers explaining that “the Islamic State of Iraq and Syria sprang from a largely self-funded, corporation-style prototype. … The militant group [that ISIS leader Abu Bakr al-] Baghdadi inherited had in place a sophisticated bureaucracy that was almost obsessive about record-keeping. Too bad, our corporations don’t disclose, much less quantify, the metrics of the negative social impacts they cause and what that costs society or the world. The more lurid the reporting on the butchery now underway, the more we forget that possibly one million-plus died as a result of the 2003 U.S. invasion and occupation or how the organized violence of the state inevitably inspires a violence of resistance. It is a violence that anti-colonial theorists like Franz Fanon approved of in his The Wretched of the Earth because he believed it has a positive psychological impact on the oppressed. Selective reporting on the atrocities of the other side always emboldens a sense of righteousness, even as our counter-violence assumes the form of less visible and far more deadly “shock and awe-ful” airpower or the use of weapons with nuclear materials like depleted uranium. Throughout the Iraq War, there have been few reports on U.S. war crimes in the U.S. controlled media with its history of loyal embeds and patriotic correctness. No one in the U.S. mainstream media has reminded us of the U.S. torturers of Abu Ghraib prison or the counter-terror campaigns that the U.S. waged against towns like Fallujah and the people we demonized as “bad guys.” It may also be time to revisit our own baggage by going deeper into our own history, including the history of the U.S. invasions of the Philippines, Haiti and Vietnam. Pick up a copy of the latest edition of the New York Review of Books to read about the unspeakable crimes that Americans imposed on each other during the Civil War, supposedly the war for freedom against slavery. Civil War expert James M. McPherson tells us about professional historian Michael C.C. Adam’s new book, Living Hell: The Dark Side of the Civil War. It is an American story of gore, not glory, in which black soldiers who surrendered were slaughtered and POWs on both sides perished in unspeakably horrific prison camps. The point here is not to rationalize ISIS’ brutality, but to take the luster off U.S. hypocrisy, to make the old point about who is calling the kettle black? In our faith in American “exceptionalism,” recently re-enunciated by President Barack Obama, most of our media and educators ignore crimes committed but rarely acknowledged in our name. Our failure to demand or take part in a truth and reconciliation process in Iraq not only makes us culpable, but assured the spectacle that we are seeing. In fact, according to journalist Dahr Jamail, U.S. policymakers systematically pursued divide and conquer policies reinforcing a Sunni/Shia divide. Who helped create and fund ISIS? Is Sen. Rand Paul correct in suggesting the U.S. played a role? What role was played by our “allies,” the Kuwaitis, Saudis and Qataris? Shouldn’t the media try to find out? Why are ordinary Iraqis telling reporters that they prefer ISIS to the brutal Iraqi Army, even welcoming them in some areas as liberators. Bear in mind that the term “barbarian” is commonly used to refer to the “uncivilized.” It is always a reference to “the others,” the never-quite humans whom we demonize and stereotype before seeking to kill. And now, the Iranians are said to be moving militarily to support Shia groups using drones they built on our designs and shipping weapons to the border so this conflict promises to escalate into a regional war. 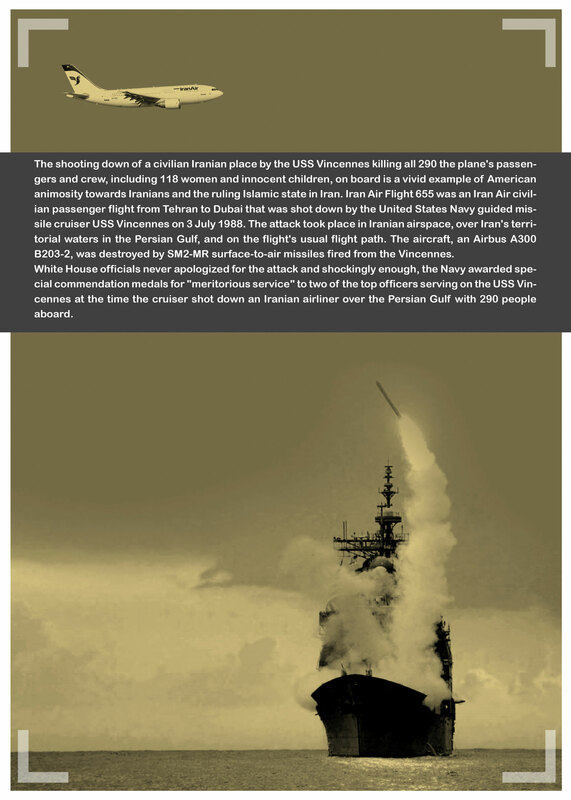 Significantly, at the same time, the organizers of a film festival in Iran are calling attention to an anniversary: the shooting down of the (civilian) Iran Air flight 655 by the U.S. Navy’s guided missile cruiser USS Vincennes on July 3, 1988. The U.S. never apologized for the incident and the ship’s commanders received commendation medals for their service. Once you see these posters, you realize how the past is never past and how hatred for past crimes – in the absence of accountability for the war criminals and justice for their victims – easily turns into fuel for future crimes. News Dissector Danny Schechter blogs at Newsdissector.net and works on Mediachannel.org. He has directed a film and written two books on media complicity in the Iraq War. Comments to dissector at mediachannel.org. I started volunteering with ShitHarperDid in 2011, appearing in our very first video that went viral during the election. Today I’m happy to share a very exciting new project with you. I think you will really enjoy it. I packed up and moved to Toronto to be closer to my family (and my favorite baseball team!). I was full of knowledge and drive and ready to do whatever was necessary to find a job that made use of my new degree. But all I have found is unemployment, precarious work, unpaid internships and more unemployment. I’m not alone, unemployment for people under 35 in Canada is nearly double the national average.1 On top of that, as a person of colour I’m part of a population that still struggles for equal pay. The Conservative Economic Action Plan has done nothing to address this sort of injustice. Instead, it’s only made things worse. Canada’s 86 richest Canadians now have as much money as the 11.4 million poorest people.3 That’s just straight up unacceptable. Yet, instead of dealing with these systemic problems, the Conservatives just bombard us with Economic Action Plan ads meant to convince the public that everything is great. Our EconomicActionPlan.ca campaign has cost less than 0.00005% as much as the Conservatives’—but it contains 100% more facts. With your help we hope to take over TV sets across the country this summer. If just a thousand of us chip in $10, we can air our first ad during primetime on CBC World Cup Coverage on July 1st! Here’s a bit of history from another America: the Bill of Rights was designed to protect the people from their government. If the First Amendment’s right to speak out publicly was the people's wall of security, then the Fourth Amendment’s right to privacy was its buttress. It was once thought that the government should neither be able to stop citizens from speaking nor peer into their lives. Think of that as the essence of the Constitutional era that ended when those towers came down on September 11, 2001. Consider how privacy worked before 9/11 and how it works now in Post-Constitutional America. Less is understood about how corporate surveillance is coming to the workplace, but sooner or later -- count on it -- the company or business you work for will be capable, via intelligent software, of monitoring every move you make, not to speak of everyone you may be in touch with while on the clock. The truth is, whatever the euphemisms, just about every imaginable way of knowing and surveilling you is here or on its way. In Oakland, California, for instance, you could mistake the anodyne name of “the Domain Awareness Center” for the latest in New Age spiritualism. In fact, as CNN recently reported, it’s a “proposed central surveillance facility where authorities can monitor the Port of Oakland and the city's airport to protect against potential terrorism.” Someday, it may integrate “live, 24/7 data streams from closed circuit traffic cameras, police license plate readers, gunshot detectors, and other sources from all over the entire city of Oakland.” This means that, despite theoretically being on the lookout for terrorists (how many of those are there in Oakland? ), it will be able to track you anywhere in the area. It’s no exaggeration to say that in our developing brave new world of surveillance, inside or outside your house, there will be nowhere that you aren't potentially trackable and surveillable, no space that is just yours and no one else's. This also means that, however bad you think it is, government and corporate employees somewhere are already creating the next set of processes, technologies, and facilities to monitor you in yet more vivid detail. In Post-Constitutional America, the government might as well have taken scissors to the original copy of the Constitution stored in the National Archives, then crumpled up the Fourth Amendment and tossed it in the garbage can. The NSA revelations of Edward Snowden are, in that sense, not just a shock to the conscience but to the Fourth Amendment itself: our government spies on us. All of us. Without suspicion. Without warrants. Without probable cause. Without restraint. This would qualify as “unreasonable” in our old constitutional world, but no more. Here, then, are four ways that, in the name of American “security” and according to our government, the Fourth Amendment no longer really applies to our lives. Begin at America's borders. Most people believe they are “in” the United States as soon as they step off an international flight and are thus fully covered by the Bill of Rights. The truth has, in the twenty-first century, become infinitely more complicated as long-standing practices are manipulated to serve the expanding desires of the national security state. The mining of words and concepts for new, darker meanings is a hallmark of how things work in Post-Constitutional America. Over the years, recognizing that certain situations could render Fourth Amendment requirements impractical or against the public interest, the Supreme Court crafted various exceptions to them. One was the “border search.” The idea was that the United States should be able to protect itself by stopping and examining people entering the country. As a result, routine border searches without warrants are constitutionally “reasonable” simply by virtue of where they take place. It’s a concept with a long history, enumerated by the First Congress in 1789. Those modest exceptions were all part of constitutional America. Today, once reasonable searches at the border have morphed into a vast “Constitution-free zone.” The “border” is now a strip of land circling the country and extending 100 miles inland that includes two-thirds of the U.S. population. In this vast region, Customs and Border Protection (CBP) can set up checkpoints and conduct warrantless searches. At airports, American citizens are now similarly subjected to search and seizure as filmmaker Laura Poitras -- whose work focuses on national security issues in general and Edward Snowden in the particular -- knows firsthand. Since 2006, almost every time Poitras has returned to the U.S., her plane has been met by government agents and her laptop and phone examined. There are multiple similar high-profile cases (including those of a Wikileaks researcher and a Chelsea Manning supporter), but ordinary citizens are hardly exempt. Despite standing in an American airport, a pane of glass away from loved ones, you are not in the U.S. and have no Fourth Amendment rights. How many such airport searches are conducted in the aggregate is unknown. The best information we have comes from a FOIA request by the ACLU. It revealed that, in the 18-month period beginning in October 2008, more than 6,600 people, about half of them U.S. citizens, were subjected to electronic device searches at the border. Here’s another example of how definitions have been readjusted to serve the national security state's overriding needs: the Department of Justice (DOJ) created a Post-Constitutional interpretation of the Fourth Amendment that allows it to access millions of records of Americans using only subpoenas, not search warrants. A subpoena on the other hand is nothing more than a government order issued to a citizen or organization to do something, most typically to produce a document. Standards for issuing a subpoena are flexible, as most executive agencies can issue them on their own without interaction with a court. In such cases, there is no independent oversight. The Department of Justice now claims that, under the Fourth Amendment, it can simply subpoena an Internet company like Facebook and demand that they look for and turn over all the records they have on our Mr. Anderson. Their explanation: the DOJ isn't doing the searching, just demanding that another organization do it. As far as its lawyers are concerned, in such a situation, no warrant is needed. In addition, the Department of Justice believes it has the authority to subpoena multiple records, maybe even all the records Facebook has. Records on you? Some group of people including you? Everyone? We don't know, as sources of data like Facebook and Google are prohibited from disclosing much about the information they hand over to the NSA or other government outfits about you. It’s easy enough to miss the gravity of this in-house interpretation when it comes to the Fourth Amendment. If the FBI today came to your home and demanded access to your emails, it would require a warrant obtained from a court after a show of probable cause to get them. If, however, the Department of Justice can simply issue a subpoena to Google to the same end, they can potentially vacuum up every Gmail message you’ve ever sent without a warrant and it won’t constitute a “search.” The DOJ has continued this practice even though in 2010 a federal appeals court ruled that bulk warrantless access to email violates the Fourth Amendment. An FBI field manual released under the Freedom of Information Act similarly makes it clear that the Bureau’s agents don’t need warrants to access email in bulk when it’s pulled directly from Google, Yahoo, Microsoft, or other service providers. How far can the use of a subpoena go in bypassing the Fourth Amendment? Recently, the inspector general of the Department of Veterans Affairs (VA) issued a subpoena -- no court involved -- demanding that the Project On Government Oversight (POGO) turn over all information it has collected relating to abuses and mismanagement at VA medical facilities. POGO is a private, non-profit group, dedicated to assisting whistleblowers. The VA subpoena demands access to records sent via an encrypted website to POGO under a promise of anonymity, many from current or former VA employees. Rather than seek to break the encryption surreptitiously and illegally to expose the whistleblowers, the government has taken a simpler, if unconstitutional route, by simply demanding the names and reports. POGO has refused to comply, setting up a legal confrontation. In the meantime, consider it just another sign of the direction the government is heading when it comes to the Fourth Amendment. Some observers suggest that there is little new here. For example, the compiling of information on innocent Americans by J. Edgar Hoover's low-tech FBI back in the 1960s has been well documented. Paper reports on activities, recordings of conversations, and photos of meetings and trysts, all secretly obtained, exposed the lives of civil rights leaders, popular musicians, and antiwar protesters. From 1956 to at least 1971, the government also wiretapped the calls and conversations of Americans under the Bureau’s counterintelligence program (COINTELPRO). But those who look to such history of government illegality for a strange kind of nothing-new-under-the-sun reassurance have not grasped the impact of fast-developing technology. In scale, scope, and sheer efficiency, the systems now being employed inside the U.S. by the NSA and other intelligence agencies are something quite new and historically significant. Size matters. To avoid such encroaching digitization would essentially mean withdrawing from society, not exactly an option for most Americans. More of life is now online -- from banking to travel to social media. Where the NSA was once limited to traditional notions of communication -- the written and spoken word -- new possibilities for following you and intruding on your life in myriad ways are being created. The agency can, for instance, now collect images, photos, and video, and subject them to facial recognition technology that can increasingly put a name to a face. Such technology, employed today at casinos as well as in the secret world of the national security state, can pick out a face in a crowd and identify it, taking into account age, changes in facial hair, new glasses, hats, and the like. An offshoot of facial recognition is the broader category of biometrics, the use of physical and biological traits unique to a person for identification. These can be anything from ordinary fingerprinting to cutting-edge DNA records and iris scans. (Biometrics is already big business and even has its own trade association in Washington.) One of the world's largest known collections of biometric data is held by the Department of State. As of December 2009, its Consular Consolidated Database (CCD) contained more than 75 million photographs of Americans and foreigners and is growing at a rate of approximately 35,000 records per day. CCD also collects and stores indefinitely the fingerprints of all foreigners issued visas. With ever more data available, the NSA and other agencies are creating ever more robust ways to store it. Such storage is cheap and bounteous, with few limits other than the availability of electricity and water to cool the electronics. Emerging tech will surely bypass many of the existing constraints to make holding more data longer even easier and cheaper. The old days of file cabinets, or later, clunky disk drives, are over in an era of mega-data storage warehouses. Once you have the whole haystack, there’s still the problem of how to locate the needle. For this, emerging technologies grow ever more capable of analyzing Big Data. Some simple ones are even available to the public, like IBM's Non-Obvious Relationship Awareness software (NORA). It can, for example, scan multiple databases, geolocation information, and social media friend lists and recognize relationships that may not be obvious at first glance. The software is fast and requires no human intervention. It runs 24/7/365/Forever. Tools like NORA and its more sophisticated classified cousins are NSA's solution to one of the last hurdles to knowing nearly everything: the need for human analysts to “connect the dots.” Skilled analysts take time to train, are prone to human error, and -- given the quickly expanding supply of data -- will always be in demand. Automated analysis also offers the NSA other advantages. Software doesn't have a conscience and it can't blow the whistle. What does all this mean in terms of the Fourth Amendment? It’s simple: the technological and human factors that constrained the gathering and processing of data in the past are fast disappearing. Prior to these “advances,” even the most ill-intentioned government urges to intrude on and do away with the privacy of citizens were held in check by the possible. The techno-gloves are now off and the possible is increasingly whatever an official or bureaucrat wants to do. That means violations of the Fourth Amendment are held in check only by the goodwill of the government, which might have qualified as the ultimate nightmare of those who wrote the Constitution. Prior to the cell phone decision, law enforcement held that if someone was arrested for, say, a traffic violation, the police had the right to examine the full contents of his or her cell phone -- call lists, photos, social media, contacts, whatever was on the device. Police traditionally have been able to search physical objects they find on an arrestee without a warrant on the grounds that such searches are for the protection of the officers. In its new decision, however, the court acknowledged that cell phones represent far more than a "physical object." The information they hold is a portrait of someone's life like what’s in a closet at home or on a computer sitting on your desk. Searches of those locations almost always require a warrant. Does this matter when talking about the NSA's technological dragnet? Maybe. While the Supreme Court's decision applies directly to street-level law enforcement, it does suggest an evolution within the court, a recognition of the way advances in technology have changed the Fourth Amendment. A cell phone is not an object anymore; it is now recognized as a portal to other information that a person has gathered in one place for convenience with, as of this decision, a reasonable expectation of privacy. While the NSA’s electronic basket of violations of the Fourth Amendment were, pre-Snowden, meant to take place in utter secrecy, here’s a violation that sits in broad daylight: since 2002, my doctor can disclose my medical records to the NSA without my permission or knowledge. So can yours. Congress passed the Health Information Portability and Accountability Act (HIPPA) in 1996 “to assure that individuals’ health information is properly protected.” You likely signed a HIPPA agreement at your doctor's office, granting access to your records. However, Congress quietly amended the HIPPA Act in 2002 to permit disclosure of those records for national security purposes. Specifically, the new version of this “privacy law” states: “We may also disclose your PHI [Personal Health Information] to authorized federal officials as necessary for national security and intelligence activities.” The text is embedded deep in your health care provider’s documentation. Look for it. How does this work? We don’t know. Do the NSA or other agencies have ongoing access to the medical records of all Americans? Do they have to request specific ones? Do doctors have any choice in whose records to forward under what conditions? No one knows. My HMO, after much transferring of my calls, would ultimately only refer me back to the HIPPA text with a promise that they follow the law. The Snowden revelations are often dismissed by people who wonder what they have to hide. (Who cares if the NSA sees my cute cat videos?) That's why health-care spying stands out. How much more invasive could it be than for your government to have unfettered access to such a potentially personal and private part of your life -- something, by the way, that couldn’t have less to do with American “security” or combating terrorism. Our health-care providers, in direct confrontation with the Fourth Amendment, are now part of the metastasizing national security state. You’re right to be afraid, but for goodness sake, don't discuss your fears with your doctor. At this point, when it comes to national security matters, the Fourth Amendment has by any practical definition been done away with as a part of Post-Constitutional America. Whole books have been written just about Edward Snowden and more information about government spying regularly becomes available. We don't lack for examples. Yet as the obviousness of what is being done becomes impossible to ignore and reassurances offered up by the president and others are shown to be lies, the government continues to spin the debate into false discussions about how to “balance” freedom versus security, to raise the specter of another 9/11 if spying is curtailed, and to fall back on that go-to “nothing to hide, nothing to fear” line. In Post-Constitutional America, the old words that once defined our democracy are twisted in new ways, not discarded. Previously unreasonable searches become reasonable ones under new government interpretations of the Fourth Amendment. Traditional tools of law, like subpoenas and warrants, continue to exist even as they morph into monstrous new forms. Americans are told (and often believe) that they retain rights they no longer have. Wait for the rhetoric that goes with the celebrations of our freedoms this July 4th. You won’t hear a lot about the NSA then, but you should. In pre-constitutional America the colonists knew that they were under the king's thumb. In totalitarian states of the last century like the Soviet Union, people dealt with their lack of rights and privacy with grim humor and subtle protest. However, in America, ever exceptional, citizens passively watch their rights disappear in the service of dark ends, largely without protest and often while still celebrating a land that no longer exists. Peter Van Buren blew the whistle on State Department waste and mismanagement during the Iraqi reconstruction in his first book, We Meant Well: How I Helped Lose the Battle for the Hearts and Minds of the Iraqi People. A Tom Dispatch regular, he writes about current events at his blog, We Meant Well. His new book, Ghosts of Tom Joad: A Story of the #99Percent, is available now. This is the second in a three-part series on the shredding of the Bill of Rights. “Brother, brother,” a young man called on me as I hurriedly left a lecture hall in some community center in Durban, South Africa. This happened at the height of the Afghanistan and Iraq wars, when all efforts at stopping the ferocious US-western military drives against these two countries terribly failed. The young man was dressed in traditional Afghani Pashtun attire, and accompanied by a friend of his. With palpable nervousness, he asked a question that seemed completely extraneous to my lecture on the use of people history to understand protracted historical phenomena using Palestine as a model. “Brother, do you believe that there is hope for the Muslim Ummah?” He inquired about the future of a nation in which he believed we both indisputably belonged to, and anxiously awaited as if my answer carried any weight at all, and would put his evident worries at ease. Perhaps more startling than his question is that I was not surprised in the least. His is a intergenerational question that Muslim youth have been asking even before the decline and final collapse of the Ottoman Empire, the last standing Caliphate, by the end of the First World War. Despite major historical tumults, the Caliphate had remained in consistent existence since the Rashidun Caliphs (the ‘rightly guided’ Caliphs) starting with Abu Bakr in 632 CE, following the death of Prophet Mohammed. The young man’s questions summoned so much history and a multitude of meanings. Few western historians and ‘experts’ (especially those who attempted to understand Islam for the sake of applying their knowledge for political and military purposes) can possibly fathom the emotional weight of that question. “Ummah” in the young man’s question doesn’t exactly mean ‘nation’ in the relatively modern nationalistic sense. Muslims are not a race, but come of all races; they don’t share a skin color, or a life style per se, or a common language even if Arabic is the original language of the Holy Koran. Ummah is a ‘nation’ that is predicated on a set of ageless moral values, originated in the Koran, epitomized through the teachings and legacy (Sunnah) of Prophet Mohammed, and guided by Ijtihad “diligence” - explained as the independent reasoning - of Muslim scholars (ulama) based on the Koran and Sunnah. Naturally, the breakdown of Caliphate created a crisis with too many dimensions. There was the geographic breakdown of the Muslim Ummah, which despite the cultural and linguistic uniqueness of the various groups of that ‘nation’, the Ummah always possessed overriding value-based political and societal frameworks. Based on that old, but constantly revived legacy (thus ‘Ijtihad’), Muslims possessed their own equivalence of the Universal Declaration of Human Rights, the Geneva Conventions, civil codes and much more starting nearly 14 centuries ago. What was more consequential than the geographic breakdown of the Ummah was the collapse of the very fabric of society, the disintegration of the laws that governed every individual or collective relationship, every commercial transaction, rules regarding the environment, charity, the law of war, and so on. Another dissolution also took place: that of the authentic and organic moral values which allowed the Ummah to persist as many empires failed, and flourish while others decayed. The organic, self-propelled system was replaced by alternatives that have all deteriorated to the very last one. And that is where the roots of the ‘angry Muslim’ began. The Ummah continues to live as an ideal which transcends time and place. It persists despite the fact that the last century had taken an incredible toll on all Muslim nations, without exception. Even the success of many nations to gain their independence from the very colonial powers that brought the Caliphate down didn’t in any way tackle the original crisis of the once predominant, all-encompassing Muslim Ummah. Colonized Muslim societies eventually adopted the rules and laws of its former colonizers, and continued to vacillate within their sphere of influence. Post-independence Muslim nations were a hideous mix of tribalism and cronyism, with a self-serving interpretation of Islam and western laws and civil codes that were all tailored so very carefully to ensure the survival of an utterly corrupt status quo; where local rulers ensure supremacy over defeated, disoriented collectives, and western powers sustain their interests of by all means necessary. Expectedly, such a status quo couldn’t possibly be sustained. A strong and cohesive civil society had no chance of survival under oppressive regimes, and with the lack of education or opportunity, or both, generations of Muslims endured in utter despair. As an escape from their immediate woes, many Muslims sought inspiration elsewhere. They saw in Palestine a rally cry, for the ongoing resistance to foreign occupation there was a symbolic indication of a collective pulse. The wide support that Hezbollah (a Shia group) received among Sunni Muslims for its resistance to Israel was an indication that sectarian divides dwarfed when compared to the need for the Muslim Ummah to regroup around principles such as justice, thus reclaiming even if an iota of its past glory. But it was the US-led western invasions of Afghanistan and Iraq that drew the battle lines like never before. When Baghdad fell in April 2003, and as American soldiers so conceitedly drowned the once capital of the Abbasid Caliphate with their flags, many Muslims felt that their Ummah had reached the lowest depths of humiliation. And while Iraqi men and women were being tortured, raped and filmed dead or naked by smirking US soldiers in Baghdad’s prisons, a whole new nation of angry Muslim youth was on the rise. Western wars in Afghanistan and Iraq were not the exclusive harbinger of Muslim youth anger, humiliation and the current violence underway in Syria, Iraq, and other Muslim countries. The wars were the catalyst. Picture a group of ‘foreign jihadists’ as they are called, sharing a meal between battles somewhere near northern Iraq and imagine what they possibly have in common: an Iraq tortured in Bucca, a Lebanese who fought the Israelis in south Lebanon, a Syrian whose family had been killed in Aleppo, and so on. But it is not only a Middle Eastern question. The alienation and constant targeting of French and British Muslim immigrants, their mosques, their cultures, languages, their very identity, when coupled with the plight of Muslims everywhere could too have its own violent manifestation as well. British Prime Minister David Cameron is worried about the threat to the national security of his country as a result of the ongoing strife in Iraq, instigated by territorial gains of the Islamic State of Iraq and Levant (ISIL). He doesn’t seem to understand or care to understand his country’s role in the violence. US President Barack Obama continues to preach from the White House about violence and the moral responsibility of his country as if the destructive and leading role played by Washington in the Middle East is completely removed from the state of hopelessness and humiliation felt by a generation of Muslim youth. It is as if war, foreign occupation and the systematic destruction of an entire civilization - still referred to by many Muslims as an ‘Ummah’ - will come at no price, aside from fluctuating oil prices. Who are these jihadists? Many continue to ask and persistently attempt to offer answers. CIA agents? Gulf-funded terrorist groups? Misguided youth ushered in by an Iranian conspiracy to justify its appetite for regional hegemony? Foreign jihadists fighting against the Assad regime in Syria? Or perhaps with the Assad regime against his opposition? Conspiracy theories thrive in time of great mysteries. However, the alienated ‘angry’ Muslim youth is hardly a mystery, but a fully comprehendible historical inevitability. For many of them, even if they insist otherwise, the Ummah and Caliphate is more of incorporeal spaces than actual geographical boundaries. It is an escape to history, from poverty, alienation, oppression and foreign occupations. To understand that is to truly tackle the roots of violence. Ignoring it cannot possibly be an option. For a grand finale Boyce will film the creation of a human-chain, which outlines the actual size of a supertanker on Parksville Beach. Collaborating with local organization ‘Communities To Protect Our Coast’ Boyce will film the entire event to be used as the credit sequence for his film. Spread out over the sand a massive tanker outlined by people will look very impressive, creating a very strong visual message. Please wear bright green to present a unified image! Volunteers will be there to assist people to form a line on the beach that will be the length and breadth of a supertanker. The tankers proposed by Enbridge will be 345 meters, approximately the length of 3.5 football fields, and 60 meters wide. So, the more people the merrier. Timed to coincide with low tide and the end of the Canada Day parade, this event will help illustrate just how large these oil tankers are, creating an image will be seen around the world. As such please do not bring placards, just green shirts! This is a photo event not a protest. Everyone is welcome! This film was first launched as a series of mini-docs online at: www.CoastalTarSands.ca The material, with several additions including music from Layla Zoe and Richard Sales, have recently been re-edited into a 77 minute documentary. The completed film is now being submitted to film festivals across Canada. I was raised in a middle-income family with no direct experience of poverty, its causes or consequences. My parents instilled in me a steadfast work ethic: if I worked hard and did my best at whatever job I took, regardless of whether I was washing floors or answering phones or waitressing, I'd survive. This philosophy worked for me. Then I got to university and began to comprehend what poverty is all about. My social justice sensibilities expanded exponentially. I began connecting the dots between corporate capitalism's perpetual growth and profit-at-any-cost ideology, poverty, and environmental devastation. Armed with my bachelor’s degrees in English and education, and realizing that my profoundly radical awareness wasn't going to mesh well with the formalized system of education, I searched for a way to teach in creative and cooperative ways. At a workshop organized by Victoria's Inter-Cultural Association (ICA), the topic turned to the need for more alternative and independent media; access to diverse internet media news wasn’t yet available. Paul Martin's 2001 federal budget, combined with the 2001 provincial election —which saw Gordon Campbell's BC Liberals take 77 of 79 seats in the legislature—resulted in dramatic austerity measures that we still feel today. Canada remains the only industrialized nation without a national housing plan. Victoria's street population began to increase visibly throughout the early 2000s, and we didn't have a voice. During the 1990s, Victoria had known the Victoria Street Press (produced by street youth through the Victoria Street Community Association) and the Red Zone (published periodically by a small group of volunteers), which had supported a few vendors for a couple of years. Someone at the ICA workshop suggested it was time for another street newspaper. It was an exciting opportunity to provide a voice for marginalized individuals, combined with a distribution method that employed them. I picked up that ball and ran with it. The first issue of Victoria Street Newz, six pages on 8.5 x 11 paper, stapled at the corner, was released April 1, 2004. I took a small stack to a peace rally and sold enough, among my friends and allies, to cover the costs. From there, I created a non-profit society called the Bread and Roses Collective and started writing grants. I embraced an "if you build it they will come" mentality. I worked month-to-month, as funding permitted. My workload was made significantly easier when John Chomyn showed up and, after a few months selling the paper, offered to manage the distribution and vendor coordination. I'm not sure we would have made it these ten years without John's diligent assistance! Through the decade, Street Newz received and published submissions of poetry, photography, and personal stories from people living in poverty and their allies. Some of our regular contributors were cyann ray, a disabled woman who shared some of her life's challenges; kym hothead, a transgendered anti-poverty advocate; and Mark Idczak, prolific street poet. Our writing and publishing consistency ensured vendors a quality newspaper they could proudly sell to a dedicated customer base, thereby supplementing their meager disability or seniors' pensions. With many fond memories, Street Newz is now retired. I've learned more than I ever wanted to know about the root causes and devastating consequences of poverty. I've made many friends, and a few philosophical enemies. When we received a shredded Street Newz in the mail along with a nasty note, I knew we were on the right track! If there's one thing my university studies taught me, it's that the historical characters who have dared to speak truth to power were lied about, ridiculed, sometimes completely destroyed. I won't say I'm a great historical character, but I know that all of us who have written for and sold the Street Newz this past decade are in very good company! Street newspapers exist all over this world in nearly every major city on every continent. They offer dignified employment to people living vulnerable lives. Ideally, they provide a place to honestly analyze and critique the dominant culture, to glimpse into the world of people who live on the margins, to ask the big questions. Like Megaphone magazine, Victoria's Street Newz was a proud member of a global family of street newspapers though we were unique in a couple of ways. We really tried to embrace the tenet of "Nothing About Us Without Us" and consistently sought content from people directly experiencing poverty or homelessness. We also tried to encourage the broader community to embrace a "pay what you can" attitude by offering the newspaper by donation rather than for a fixed price. It was a difficult decision to retire the Street Newz completely, but I want it to live in peoples' memories for the gritty, grassroots project it was. I've enjoyed a congenial relationship with Sean Condon and Megaphone for many years, as Vancouver's street paper has grown and evolved into a quality news journal that combines professional journalism with writing produced in their own workshops. When I received Sean's email affirming that they'd be happy to move into our neighbourhood, I knew I could step away gracefully, leaving our vendors and readers in good hands. Through these years I've developed a real understanding of the kind of camaraderie that happens within communities of people who struggle to survive. We have brilliant ideas about how to rearrange society so everyone can live healthier and happier with more equity and security. We work to help each other heal from the traumas we've experienced. We all have stories to tell, and creativity to explore. So welcome to Victoria, Megaphone. And thank you, all, for your support. Janine Bandcroft worked as founding editor of Victoria Street Newz from April 2004 to June 2014. She remains as host of the Winds of Change radio program airing at CFUV alternate Thursdays, and plans to stay connected with Victoria’s street community. janinebandcroft.wordpress.com. Apparently ISIS is a business, a bloody and illegal business, sort of like the Mafia. That’s what I gleaned from a McClatchy report by Hannah Allam on the group’s finances, revealed at least by a trove of documents captured by the US, turned over to RAND a few months ago, whose conclusions leaked into the public sphere today. Mosul was the Islamic State’s fundraising nerve center for years before the city fell to ISIS this month, according to Johnston’s analysis of the documents. A key to understanding the city’s enduring importance to the group comes from a Mosul “administrative emir” whose meticulous records from August 2008 to January 2009 were seized and added to the database. In accordance with the Islamic State’s business model, Johnston said, cells were required to send up to 20 percent of their income from local enterprises _ such as kidnapping ransoms and extortion rackets _ to the next level of leadership. Higher-ranking commanders would examine the revenues and redistribute the funds to provincial or local subsidiaries that were in dire straits or needed additional money to conduct attacks. The records show that the Islamic State was dependent on the Mosul members for cash, which the leadership used to bail out struggling militants in the volatile provinces of Diyala, Salahuddin and even Baghdad. Looking at ISIS as a high-level crime syndicate in the matter of its operating philosophy (as opposed to its core convictions centered on establishment of a new “caliphate”) would explain some puzzling elements of the group’s behavior, ones that don’t fit in with the usual perception of extremist, caliphate-committed jihadist groups. For one thing, ideological purity does not interfere too much with operational opportunity. ISIS is out to earn, increase its footprint, and magnify its clout. When ISIS is ready to roll somebody, it goes ahead; but if the time isn’t ripe, it coexists. And, when it can gain the cover of a compromised local political machine, it co-opts. ISIS has made a big show of turning over the administration of Mosul to its local Sunni allies; when the Baji refinery fell, ISIS announced that local elements, not ISIS, would run it (though the decision to put some distance between itself and an abandoned refinery with a giant bulls’ eye painted on it might not be an instance of unalloyed ISIS altruism). In northern Iraq, ISIS is happily collaborating with ex-Baathists and Sunni tribal chiefs; in Syria, it is murderously muscling in on the turf of fellow jihadis Jabhat al Nusra. It demonstrates its ideological rigor by massacring Christians and Shi’as, the very groups it is trying to demoralize in its drive toward southern Iraq. ISIS’ unwillingness to take it to the Assad regime has opened ISIS to accusations that it’s in the pockets of the Syrian government and Iran; however, ISIS’ forbearance may simply mean that it is waiting for the right opportunity to make its move in Syria. If, as per RAND via McClatchy, the group’s financial heart is Mosul, that would explain the rapid takeover; ISIS was simply coming out of the shadows to assert control of the city whose economic and political life it already dominated. The most interesting question, for Americans at least, is how ISIS fits into the strategies and tactics of the Gulf States, particularly Saudi Arabia. Is ISIS simply an astoundingly successful local startup that is unilaterally driving the agenda in Iraq; or is it an element in some Saudi strategy to confound Iran and the Shi’a world? Certainly, Saudi Arabia seems pretty happy with ISIS’ challenge to the Maliki government. But whether ISIS is simply another Gulf-funded jihadi shop is open to question. RAND analysts assert that ISIS received only 5% of its funding from the Gulf, and draw the inference that Gulf influence and control is not decisive. This doesn’t quite make the case—despite the palpable desire of the Saudis to rebut Iranian and Iraqi accusations that ISIS is bankrolled by the Gulf--since the records only go up to 2010, when ISIS was more of a struggling startup and had yet to come under the leadership of Abu Bakr al Baghdadi. Who knows, maybe with the acquisition of Baghdadi’s top-flight management skills, ISIS became eligible for a round of angel financing from well-heeled jihadi VCs in the Gulf. It does seem that ISIS, with its best-practices operational, political, communications, and business strategy seems more sophisticated than anything the sclerotic Saudi security establishment could come up with on its own, or even with the eager advice of Israel. However, I speculate that there is a collaboration going on between ISIS and Saudi Arabian security elements, but one that is initiated and to a certain extent controlled by ISIS, rather than the other way around. Saudi Arabia, in other words, is just another big player in the Middle East to be wooed, threatened, and exploited by ISIS as circumstances dictate. Anbar sheiks and local Ba’athists have, I would expect, a pretty clear-eyed understanding that ISIS will treat them well only as long as it is in ISIS’ interests to do so. Al Qaeda in Iraq, after all, became an onerous and resented burden in Anbar, which the sheiks were able to shed through the “Anbar Awakening” i.e. death squads a go go a.k.a a JSOC/Sons of Iraq joint operation. So I speculate that the cooperation of local non-jihadist anti-Maliki Sunnis with ISIS is predicated on the understanding that Saudi Arabia is condoning and endorsing the ISIS campaign, with the idea that once a “government of national unity” i.e. government with a Sunni veto is installed in Baghdad, or the whole country just fragments into de facto and increasingly de jure Sunni, Shi’a, and Kurdish zones, the Gulf states will step up in financial and security matters to avoid ISIS completely filling the resultant political and economic vacuum. In other words, I think Saudi Arabia may have funneled money to ISIS as the “best of breed” jihadi startup, blessed the ISIS advance into northern Iraq, maybe jumpstarted the instantaneous collapse of the Iraqi army with some judiciously distributed bribes, and encouraged Sunnis in the government to let the Maliki government twist in the wind. At the same time Saudi Arabia is abetting ISIS’ operations, it has avoided endorsing ISIS as its creature, and is reaching out to ISIS collaborators to assure them that there is an endgame other than lonely subjugation to ISIS and its criminal exactions once the situation in Baghdad shakes out. As for the United States, the unhappy handwringing has not been unexpected. Clearly, America wants to see the twisted wreck of Iraq in its rearview mirror and doesn’t want to have to return to the scene to bandage the bloody, wailing victims. Nevertheless, the willingness of the Obama administration to take time out to flay the Maliki administration for its amply-documented political sins and push for a leadership change, instead of focusing on the threat from an extremely successful black-flag waving/sectarian massacring ISIS outfit is rather remarkable. If the United States had any security role in the Middle East beyond the “it’s the oil stupid” rationale, one would think it would include supporting a secular democracy trying to forestall military conquest by advocates of a fundamentalist caliphate. The conspicuous lack of an Iraqi man on horseback capable of uniting sects and ethnicities to protect the Baghdad government makes the decision to overthrow the current man on horseback and hope for the best look pretty dubious. The US “decapitate the regime and everything will work out great” strategy has failed rather spectacularly in 1) Saddam’s Iraq 2) Libya 3) Egypt 4) Afghanistan 5) Syria (still pending but already FUBAR) does not quite vindicate the idea that, with its capital under threat, what Iraq really needs now is a struggle to fill a power vacuum at the highest level of government. One can suspect that the US is not ready to take the momentous step of openly backing Iran and Iran’s man (Maliki) in an Iraq clash when Saudi Arabia and Israel obviously want things to go the opposite way. Supporters of this view—maybe some funded by KSA, Israel, and the rest of the anti-Iran bloc, I dunno-- spend a lot of time dumping on Maliki as the author of Iraq’s predicament, while trying—in a manner I find rather unconvincing—to shoehorn ISIS into the “armed auxiliary of populist uprising” narrative. Well, I guess if Pravy Sektor can be spun as the midwife to the birth of Ukrainian democracy, it’s not too much of a stretch to characterize ISIS as the handmaiden of social and political justice in Iraq. But at the same time, of course, the US tries to play on the Iran side of the field—President Obama is, after all, still desperately attempting to normalize relations with Iran, which is, sorry Israel, the only stable democracy left standing in the Middle East—so Iraq gets 300 US advisors. With the brave 300 comes, of course, the possibility of some morale-boosting air strikes against ISIS, which is apparently a difficult nut for the US to target even though its fighters are now driving Iraq Army-supplied Humvees and tanks all over the barren, very barren, so very exposed landscape. The China Hand crystal ball tells me that, as long as that equipment is driving toward Syria, US targeteers, torn by the US policy of supporting ISIS in Syria while griping on ISIS in Iraq, will encounter insurmountable difficulty in identifying and destroying it. In other words, maybe the United States, like every other power in the region, is getting played by ISIS. Welcome to the club! A Media Lens reader quipped recently that he had discovered a solution to the climate crisis. Simply harnessing the energy produced by Orwell turning in his grave would provide a limitless source of cheap, clean energy. 'Tony Blair is not gloating. He could - but he prefers to appear magnanimous in what he hopes is victory. In our Guardian interview yesterday, he was handed a perfect opportunity to crow. He was talking about what he called 'the ripple of change' now spreading through the Middle East, the slow, but noticeable movement towards democracy in a region where that commodity has long been in short supply. I asked him whether the stone in the water that had caused this ripple was the regime change in Iraq. That warmongers like Aaronovitch and Freedland can still hold down senior positions in the media means there is a desperate need for analysis that punctures the façade of liberal journalism. A key problem is that corporate journalists cannot or will not criticise either their own employers or potential future employers. Like all corporate employees, journalists who criticise their industry are unlikely to be embraced by any media corporation. This is why Freedland, Aaronovitch, the Guardian and the Independent are almost never subjected to honest criticism from a left perspective. On the contrary, aspirant left writers bend over backwards to praise corporate journalists and media, as do ambitious executives in every industry. Over ten years ago, when Media Lens was but a toddler, Kingsnorth had been on the staff of The Ecologist where we had a regular 'Media Watch' column. The editors quickly tired of what was perceived as our relentless 'attacks' on the liberal media, notably the Guardian. Surely there were 'better' targets – the Mail, the Sun, The Times and so on? The end came when we wrote critically about the Guardian's John Vidal, a friend and ally of the magazine. We were making life difficult for their pals at the Guardian – the supposed flagship of environmental journalism – and perhaps an outlet they themselves aspired to write for. 'It may well be too late for the Guardian as a news organisation'. Thirteen years after Media Lens was set up, we are indeed 'still at it'; and in no small part because of the financial support we receive from many hundreds of people every month. We originally worked in what spare time we could find away from other, paid employment before sufficient income allowed both editors to go full-time on Media Lens: first David Edwards (in 2003) and then David Cromwell (in 2010). We are 100% reliant on public support; we take no funding from other sources (nor do we seek it). We are immensely grateful to everyone who sends us donations, large or small, whether one-off or regular amounts. As regular readers will know, around once a week we send out a media alert – an in-depth analysis of a vital issue ignored or badly skewed in the corporate media. Every day, we post frequent observations, comments and useful links via our message board, Twitter feed and Facebook page. We also publish occasional Cogitations on more spiritual, philosophical themes. Everything we do is free of charge. If you feel you are in a position to support us, we would be very grateful for any donation you are able to make via one of the available methods outlined on our Donate page. Whether you are able to send a donation or not, we value the contributions you make with your feedback, suggestions and in sharing our work with others.